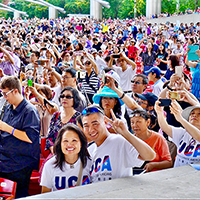 Houston- A group of national and local Asian American organizations will hold an educational forum on Saturday, September 22, 2018 from 10 am to 3 pm at the Crowne Plaza Suites, 9090 Southwest Freeway @ Gessner. 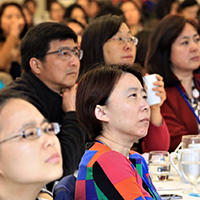 It is free and open to the public, but space is limited, and reservations are required at http://bit.ly/2018ESPForum. This educational forum will provide the opportunity for the Asian American community to have a direct dialogue with FBI, attorneys and academic and community leaders. 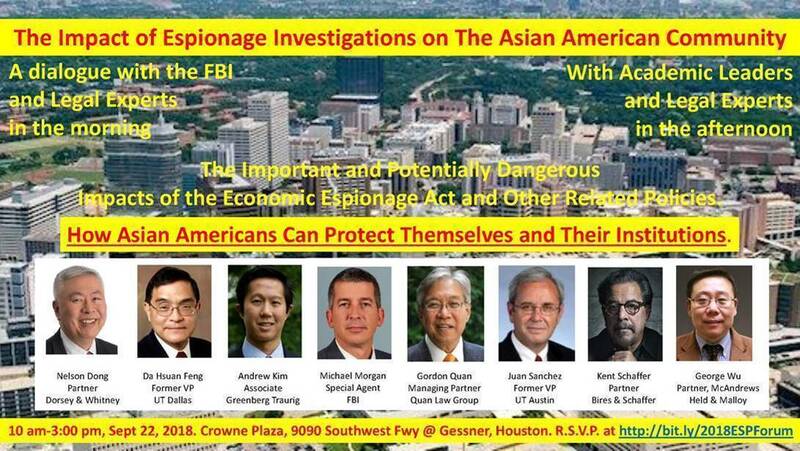 The important and potentially dangerous impacts of the economic espionage act and other related policies and how Asian Americans can protect themselves and their institutions will be discussed. WHY IS THIS ISSUE SO IMPORTANT TO OUR COMMUNITY? In recent years, a number of innocent American citizens of Asian descent have been falsely accused of espionage. On August 26, 2018, CBS 60 Minutes broadcasted “Collateral Damage,” about two American scientists, Sherry Chen and Xiaoxing Xi, whose lives were turned upside down by such accusations. Indeed, Sherry Chen was fired for untrustworthiness after she was exonerated. Disregarding the order by the Chief Administrative Judge of the U.S. Merit Systems Protection Board to reinstate Sherry Chen to her position on Apr. 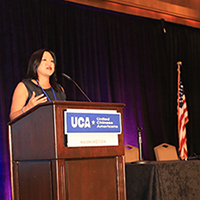 23, 2018 and a letter signed by over 30 Members of Congress that was sent to the Office of Inspector General, the U.S. Department of Commerce still refused to return Sherry Chen to her previous position back since she was taken from her office on Oct. 20, 2014. Although Sherry Chen and Xiaoxing Xi may appear to be isolated incidents, a recent study published by the Committee of 100, suggests that as many as 1 in 5 people of Asian heritage accused of espionage may be innocent. In developing this forum, the organizing committee intended that it should inform and educate the Asian community on how to prevent such situations to befall them, especially to those in positions in the government, business, research and academic sectors. Nelson Dong, a member of the Committee of 100, will be the key note speaker at lunch. Mr. Dong is a partner in Dorsey’s Corporate group, Chair of the National Security Law practice, co-Chair of the Asia-Pacific practice and a leading expert in domestic and international technology and intellectual property. The afternoon panel discussion will be joined by leaders of Texas higher education, including Dr. Da Hsuan Feng, former Vice President for Research at the University of Texas at Dallas who will moderate; Dr. Juan Sanchez, Temple Foundation Endowed Professor and former Vice President for Research at the University of Texas at Austin; George Wu, Partner at McAndrew’s Held & Malloy LTD and Nelson Dong, who will serve as panelists.